First off this is far lighter than I normally take to, but it sounded interesting so I gave it a shot. 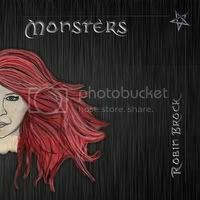 The music from Canadian vocalist/songwriter Robin Brock reminds me some of a cross between 1980's Heart and Pat Benatar. The styles range from classic rock to pop rock with some electronica mixed in. Although the styles are rarely mixed within a song. Instead it's more like one style per song. I am not sure if the lyrics are supposed to be tongue in cheek or not, but there are certainly poor. If it's supposed to be joke than I can look past them to some extent although many of the songs contain choruses that are far more repetitive than they need to be. The one consistant throughout "Monsters" are the vocals. Even when the lyrics struggles Brock's voice is stellar and shines through on tracks like "Masters and slaves" and "Warrior". She handles steady ballads, gritty rockers and bouncy pop rockers with the same amoung of power and force. The quality of her voice helps to elevate the song even when the cracks start to show in the writing. It took me a few plays to warm up to it and it still has some flaws, but it comes off as a refreshingly good effort.